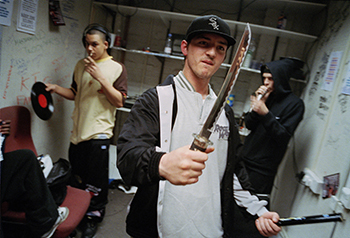 "The kids in my photos had already seen this odd guy for three or four years with his head down in a 6x6 camera photographing bits and pieces of an estate," recalls Simon Wheatley, explaining how he came became the (un)official photographer of London's grime scene in the noughties. "If I was an undercover fed, it was a pretty obtuse way of going about it." After building a reputation for his gritty medium format compositions of south London's council estates, Wheatley arrived in the east of the capital in 2004 as the regular photographer for street music magazine RWD. The publicity he garnered for snapping the likes of Dizzee Rascal turned him into something of a local grime scene celebrity himself – "I was the man," he says. 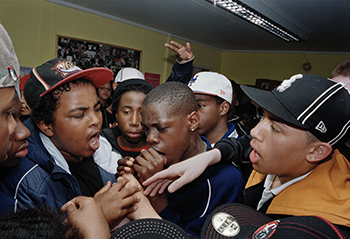 "That's why I spent so long photographing grime: I felt it had a lot to answer for." However, Wheatley is quick to add that there was a whole lot more to capturing the deeply personal images featured in his book Don't Call Me Urban! The Time of Grime than mere reputation. "That fame only buys you so much time," he explains. "If you're going to hang out for hours, as I had to do in order to get the precious moments that only time gives you, that requires a fundamental interest in people's lives and a concern with their struggle. "People would realise that Simon was serious about that. People respect that I took the time to get to the crux of their issues." The fruits of Wheatley's labour are currently on show in the Grove Atrium at Middlesex's Hendon campus as the precursor to School of Law Lecturer Dr Simon Harding's one-day conference on London's gangs on 5 September. 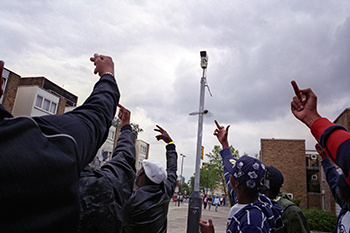 In a recent interview with mdx.ac.uk, Dr Harding said he believes that the grime music Wheatley is so familiar with isn't to blame for the rise in gang violence in the capital – the Middlesex academic instead focuses on poverty – but the softly spoken photographer isn't so sure. "I agree it's a reflection of people's lives, but grime music didn't calm people down," he says, recalling how things would often "kick off" in youth clubs during grime nights as the level of tension "were stoked up" by emcees issuing their "communiqués" by microphone – including calls to arms. And while Wheatley readily acknowledges that grime music is by no means the only factor behind the rise in gang violence over the past decade – he blames Thatcherism for the breakdown in community spirit in the UK – he's keen to stress that it's one of the most important. "That's why I spent so long photographing grime: I felt it had a lot to answer for," he concludes. Simon Wheatley's photographs are on display in the Grove Atrium from now until Friday 5 September 2014.